Andover, Mass. 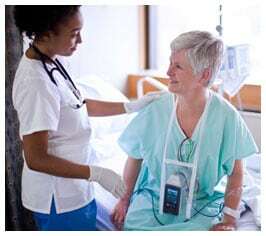 – Royal Philips Electronics (AEX: PHI, NYSE: PHG) today announced the global release of IntelliVue MX40, a wearable patient monitor that can be used for the monitoring of ambulatory patients and during patient transport. The MX40 combines the benefits of the acclaimed IntelliVue X2 and Philips telemetry into a single, compact wearable monitor. Driven by Philips’ commitment to developing innovative patient care solutions, MX40 helps clinicians to better manage patient alerts and is designed with infection control in mind. Many patients can benefit from mobile monitoring in the hospital, including those who can be monitored in a progressive care area or during supervised recovery from an acute event or surgical procedure. Mobile monitors also help clinicians spend more time with patients: one hospital estimates that its nursing staff saves an average of 40 minutes every day by using the MX40 display to check patients’ ECG rhythms, instead of calling a technician at the central station monitor. IntelliVue MX40 offers a comprehensive package of benefits including continuous monitoring over a greater range in the hospital, access to the industry-leading IntelliVue Smart-hopping Network and a color touch screen display that presents the patient’s name as well as easily accessible vital information such as ECG, SpO2 and non-invasive blood pressure. MX40 is also interoperable with the IntelliVue family of products. MX40 can help clinicians to better and more systematically manage patient alerts both at the patient and at the hospital’s central monitoring station. The solution supports the monitoring of ambulatory patients, meaning those capable of walking and not bedridden, and improves clinician workflow by providing local alarms to alert clinicians of patient condition changes no matter the patient’s location in the hospital. The IntelliVue Information Center is an integral part of the MX40 solution, providing real-time surveillance, reporting, data storage and interfacing with the hospital’s electronic medical record (EMR) system. 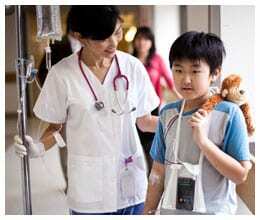 "The MX40 is helpful in streamlining patient monitoring at the bedside. 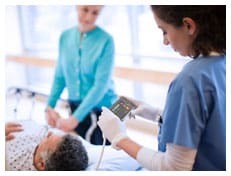 The mobile monitoring function helps us ensure patient safety during transfers and while infusing medication drips,” Alycia Kielty, RN, Surgical Cardiovascular unit, Sanford USD Medical Center in Sioux Falls, South Dakota said. “For us, these added product benefits have increased communication efficiency, and decreased the need for extra bulky equipment." “MX40 is a game-changing device, saving clinicians time by allowing them to view vital patient data on the MX40 display, rather than repeatedly walking away from the patient to check the central station monitor,” Dale Wiggins, chief technology officer, Patient Care and Clinical Informatics, for Philips Healthcare said. 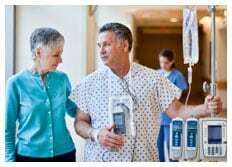 “It’s a forward-thinking piece of technology that brings clinicians and patients closer together. ”The MX40 is designed with cleaning and infection prevention in mind, featuring a unique patient cable connector that resists the collection of soil and liquids. The solution itself is smooth, allowing easy wiping, while the case material supports cleaning by many common low- to high-level disinfectants. These multiple cleaning options allow the MX40 to easily fit into programs to reduce hospital-acquired infections (HAIs), preventable infections often resulting from patients’ exposure to various microorganisms in the hospital environment.